I am not convinced that suffering has any natural tendency to produce such evils [as] anger and cynicism. … I have seen great beauty of spirit in some who were great sufferers. One such “great sufferer” must certainly be Nell Hodgson. Across a lifetime of adventures, she had faced loss of loved ones, a near-death experience while giving birth, and three bouts of cancer, not to mention numerous rounds of chemotherapy. Yet as a child, I knew none of this. Nell—or ‘Nanna’ as I knew her—was to me an imaginative storyteller … a living, breathing “Wardrobe” offering a gateway to my own Narnia. Recently I was jogging through Noosa National Park with a Canadian friend, pointing out the great diversity and character in the surrounding trees. In place of uniform stands of pines were paperbarks and gnarled gumtrees. Nanna quickly came to mind. Trees like these were features in many of her paintings, and her poems. Nanna loved nature. She used to tell tales of fairies in the garden, replete with intricate details of what each would wear and how they would move. The banksia bush had a larger-than-life personality in her imagination. At the least opportune time—like when picking me up from a friend’s place—Nanna would quietly slip out of the conversation, leaving us all wondering where she’d gone. After looking around, we would find Nanna on her knees, crawling through the garden bed. She was scraping off bits of bark from the base of a gumtree—“It’s for my bark paintings,” she explained. For Nanna, this was normal. Yet as an adult, I wonder how to integrate the playful person I knew with this scarred woman who suffered so much. Many others would become bitter given her lot. Yet Nell had an insatiable appetite for life. 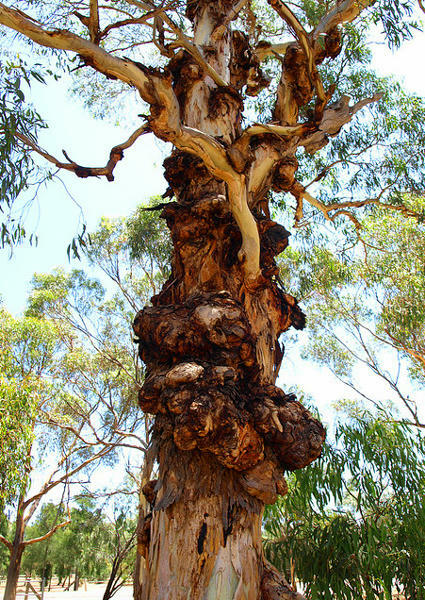 Her life resembled the gnarled yet glorious gumtrees she immortalised. Perhaps in the title to her final collection of poems we can find the answer: Rainbows in the Tears. For when love looks through tears of pain, a vision of hope will emerge. Of all the books that Nell had read, it’s no secret that her favourite was the Bible. In this “book of books” we find a recurring theme growing to a climax in the person of Christ, like the lapping of waves on a beach as they reach toward full tide. It is the pattern of grace, fall, and new grace. This book begins with God’s grace as He paints a paradise and plants humanity in the midst. Yet our forebears overreached and fell, weeping as Eden became a wasteland. Yet God extended new grace, covering our shame in love and pointing to the day when all our sad stories will come untrue. Or take Noah. Noah was the only righteous man among peers as people took pride in enacting every evil desire. So God judged the world in a flood, preserving Noah, his family, and a good deal of biodiversity in that floating safe haven. Grace had given way to fall. What would new grace look like? In Genesis 8-9 we read of the ark settling on Mount Ararat, this strange parade evacuating the vessel to see a land decimated by (super-) natural disaster. As they recalled what was, I’m sure that tears must have flooded their eyes. Yet precisely at this moment of despair, in the wake of immense suffering brought about by broken humanity, God gives us a sign. Whenever storm clouds gather, look up, for there you will see the rainbow—that even if life falls apart and flood waters rise, yet my new grace will preserve this beautiful creation in loving covenant. The rainbow is what love looks like when it refracts through this planet’s collective tears. Nell was known as a woman of faith. But this was not “faith in faith” or some subjective impulse to trust beyond reason. Not at all. Instead, my Nanna trusted in the one true Gd, who was able to take the worst suffering, and the greatest injustice, and turn it into new grace and hope for all humanity. At the Bible’s climax we see God Himself in the person of Jesus, left high and dry as He opened His arms to embrace a world gone awry. Love is cruciform. And love is passionate, where passion literally means to “suffer with.” So Nanna had faith in the God with scars. When Nanna looked through tear stained eyes at the resurrected Christ, she knew all her sad stories would one day come untrue. And the result was art fuelled by hope. This is how ‘imaginative Nanna’ and ‘suffering Nell’ fit together as one. 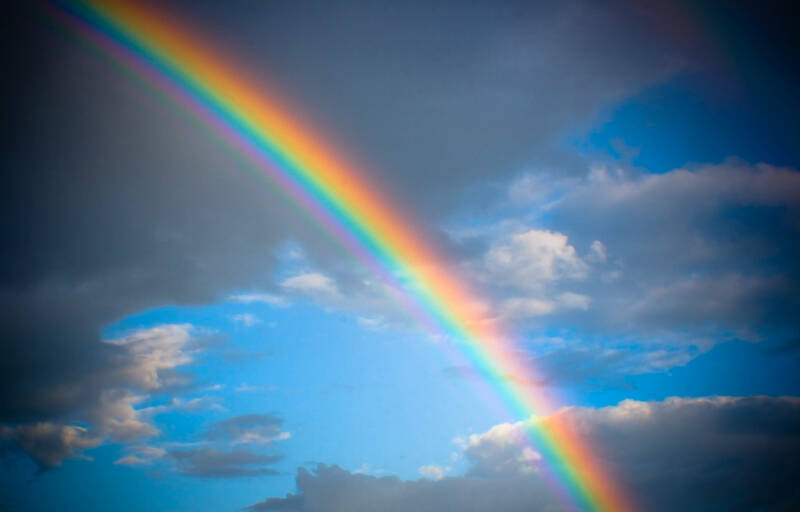 Suffering can be redemptive: there are rainbows in the tears. In my playful grandmother I’ve seen the vitality of a passionate God. God has suffered much. And yet He is ever young, always crawling through the garden beds of this world alive with wonder. May we meet Him there? The image has been changed since the first post, Jason – my sincere apologies. Still getting used to internet protocol and image copyright. I sent you an email some time back to make amends – let me know if you want to follow this up. This was most beautifully written. I, too, have been through a great deal. I thank you for your encouragement today. This is very beautiful, thank you very much for sharing you testimony with the world! Beautifully written!!! I’m glad it connected with you :) As I said to Karen, she was a wonderful lady. Such a love of life in all its highs and lows. A beautiful woman who took me in as a wee Scottish migrant and nurtured my spirit on Sundays . wow, Gail – feel like we’re family now!! My mum is Anne Benson (nee Hodgson) – do you know each other?